Marv Bird’s contributions to hockey were not limited by geographic or other boundaries. He was involved in all areas of hockey, every age level, different roles and at local, Provincial and National levels. As a player Marv once scored a deuce against the great goaltender, Glenn Hall, while trying out for the Edmonton Oil Kings, but it was not his destiny to become a career hockey player. Pro hockey’s loss was a gain for minor hockey in Grande Prairie and beyond as he served in a variety of leadership and administrative roles that have influenced not only many lives but the course of the game. Rimbey, Alberta was his birthplace in 1938 and he played hockey at various levels in Central Alberta. His journey to join the elite of hockey as a coach began in Grande Prairie with an Atom team of 9 – 10 year olds who played most of their games on the open-air rinks of the Bear Creek flats. In the years that followed Marv has coached peewee, bantam, midget, juvenile and junior teams. His character as a coach was showcased in 1986 when his bantam team won the Provincial title and in the process captured the coveted Most Sportsmanship Team Award. Their play was a reflection of Marv’s belief in teaching a blend of individual skills, team spirit, discipline, but above all, fairness and respect for others. For fourteen years he served on the Board of the Grande Prairie Minor Hockey Association and at the same time continued coaching, instructing at hockey schools, skills clinics, player development camps and conducting hockey executive management seminars. While Grande Prairie claims him as its’ own, Marv’s contribution to hockey is not confined to the local stage. His expertise is sought in Provincial, National and International hockey circles. He organized Alberta Cup camps, zone playoffs for the Alberta Winter Games, and held a number of different portfolios in Hockey Alberta including the role of President from 1994 – 1996. Beyond Alberta, Marv Bird served on the Board of Hockey Canada for 8 years, was involved with hockey at the Arctic Winter Games as Director of Operations for a number of years and was a Technical Sport Advisor at the Canada Winter Games. He is a passionate student of the sport and in order to join the gentry of hockey coaches, sought out and enrolled in the most rigorous and demanding coaching clinics and seminars in Canada and on the international stage such as the International Hockey Experts Coaching Symposium in Turku, Finland. Applying his expertise, Marv served as mentor coach to the Japanese Olympic Hockey Team and in 1992, along with other representatives from Hockey Canada, conducted a weeklong hockey camp on the island of Hokkaido. Achievements, honors and awards that bear witness to Marv’s elite status and reputation as a leader in hockey are many. In 1985, Marv earned his level five coaching certificate at a Lakehead University coaching clinic in Thunder Bay, Ontario. It is the highest coaching level attainable and was limited that year to only four Albertans. Just an invitation to this event is considered one of hockey’s most prestigious honors. Other awards include: 1985 Hockey Alberta - Minor Hockey Award; 1986 Grande Prairie Minor Hockey - Dedicated Service Award; 1988 Hockey Alberta Distinguished Service Award; 1995 City of Grande Prairie - George Repka Outstanding Citizen Award; 1997 Hockey Alberta - President's Award; and in 2004 Hockey Alberta’s - Life Membership Award. Marv is foremost among Legends who have elevated hockey in Grande Prairie to the Provincial, National and International stage. 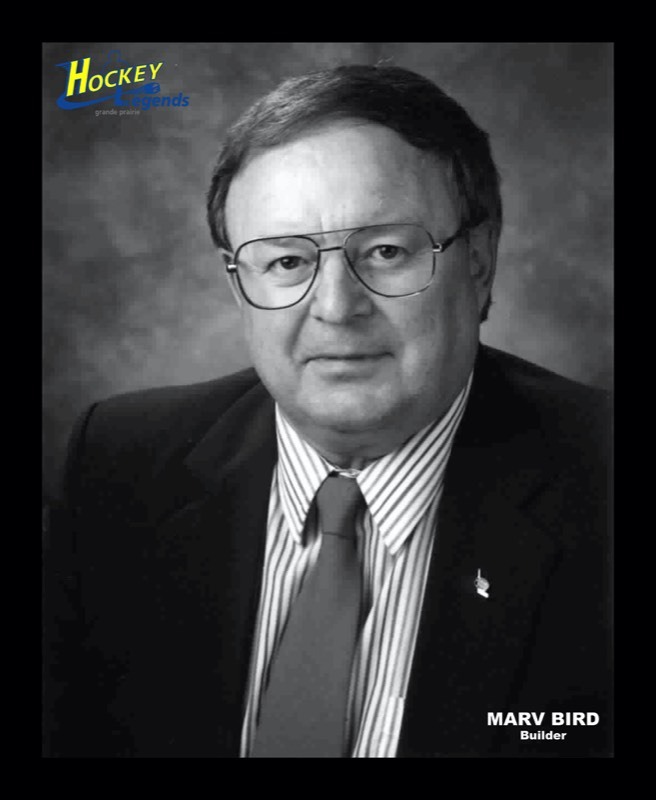 Marv Bird - a Grande Prairie Hockey Legend in 2005.